I made create.withcode.uk a few years ago to try to make it as easy as possible for my computing students to interact with python code examples on any device. I wanted to be able to step through lines of code, discuss how it worked then share it with students in a way that let them tweak it, debug it, extend it and share it without the hassle of creating user accounts. I’ve been thinking a lot recently about how to boost resilience and independence for students in a Computing classroom, particularly when it comes to debugging. One thing that I’ve noticed that makes a big difference to students is if they’re taught early on how to use debugging tools like breakpoints, stepping and watches. Stepping and watching variable values has been possible for a while in create.withcode.uk but yesterday I released an update to allow you to set breakpoints on any line of code. 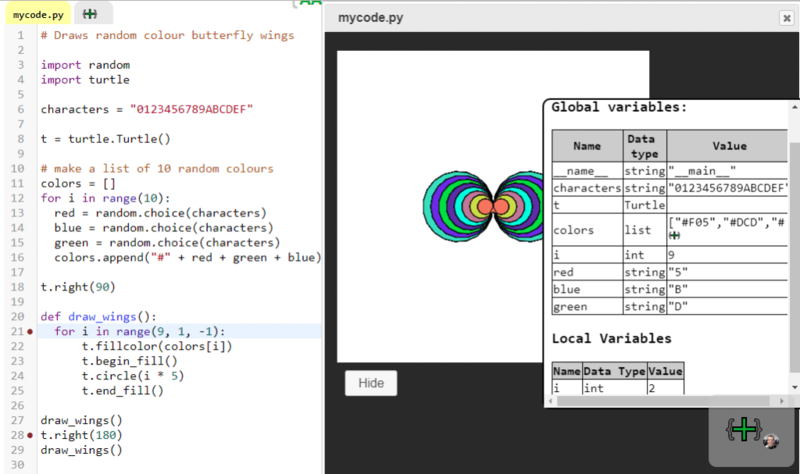 The above example shows some python code which will draw some butterfly in random colours. On the right of the screen you can see the value of each global and local variable. This is really useful for explaining how data changes as your code runs. The red blobs next to the line numbers show two breakpoints on line 21 and 28. You can toggle a breakpoint on or off by clicking on the line number. To step through one line of code at a time, press Ctrl + . It’s a work in progress, so let me know when you find any bugs or if you have any suggestions on how to improve it.